A lightweight and portable “suitcase” ramp can be secured in a location i.e. shop entrance, office or hotel lobby, where access is necessary for wheelchair users but a permanent ramp cannot be sited. 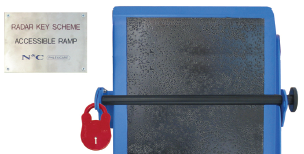 The locking station prevents unauthorised removal of the ramp but can easily be accessed with a RADAR key. 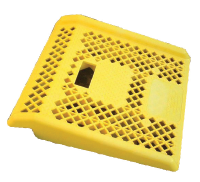 Slip resistant surface with up stands to prevent wheelchair tyres veering off the edge. Anti rust with stainless steel components. Lightweight and portable “suitcase” ramps manufactured in durable aluminium and finished in a non slip epoxy paint. Lightweight small incline ramp with integral handle. Ideal for kerbs and thresholds.